A Fraternal Brotherhood of over 200 members in Andover and over 1.9 million across the world. Access to our facility’s amenities for you and your family/friends, including our athletic facilities, members’ room, and more. Eligibility to join one of the largest insurance programs in the United States with more than $100 Billion of life insurance in force. Options include Life Insurance, Retirement Annuities, and more. An opportunity to give back to your local community, support the charities and organizations you care about, and share these experiences with your family, especially your children. Scholarship Programs for higher education available to members, their spouses, and their children. Leadership Development opportunities including organizational skills, public speaking, management, etc. 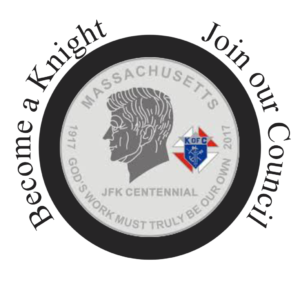 Member in the Knights of Columbus is open to men 18 years of age or older and who are practical Catholics. A practical Catholic accepts the teaching authority of the Catholic Church on matters of faith and morality, aspires to live in accordance with the precepts of the Catholic Church, and is in good standing with the Church. Membership in Andover Council #1078 is open to anyone eligible as above regardless of whether you live in Andover or any of the surrounding towns. We have members from over a dozen Massachusetts Cities/Towns, and half dozen US States. Members of the parishes of St. Augustine’s, St. Roberts, St. Williams, St. Michaels, St. Monica’s, and more are a part of our Council. Q. Do I have the time to Join? A. Yes. You can be as active as your time allows. Many members participate in less than 5 events or charitable drives a year. No one will judge your dedication by how often you help, only by the effort you make while helping. Q. I don’t attend Mass every week. Is that a problem? A. No member of the Knights will ask you about your church attendance. We hope that you grow stronger in your faith by being a Knight, but recognize that work and life often interrupts our best intentions to practice our faith. Q. Do I Have to purchase Insurance to be a member? Q. What is a Sponsor and do I have to have a Sponsor? A. A sponsor is a member of the council that proposes your membership to the Council. You do not have to have one. In the event you do not, an officer will speak with you and act as your proposer. • Membership in our Council costs $50/Year. $10/Year for College Students. • There is a $20 Initiation Fee for new members. • An optional keycard to our building costs $30/Year. Click the Image below to be taken to an electronic version of our membership form. Fill out the form and hit submit. A member of the council will contact you shortly. Feel free to ask them any questions. First Degree ceremonies are held monthly in Andover or Tewksbury. A council officer or your sponsor will attend with you.